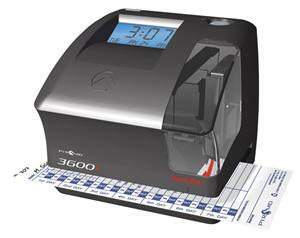 The 3600ss has been engineered to work with standard time cards or Pyramid branded time cards. In case of power failure, the unit is equipped with a large easy-to-read LCD display, internal battery that provides 30-days of memory backup, long lasting replaceable ribbon, is wall or desk mountable, and does not require resetting for short months, leap year, or daylight savings time. Dimensions: 6.25" x 6" x 6.75"